When making a credit decision lenders determine the loan applicant’s ability to repay the loan. Part of this determination involves investigating, evaluating and documenting a borrower's employment status. This examination is meant to detect potential fraud by verifying the borrower's current and likely continued employment. The process is known as Verification of Employment (VOE). The information provided within this blog post targets mortgage lending, however, many of the points can be easily applied to other lending processes (auto, HELOC, peer-to-peer, etc.). Additionally, employment and/or income misrepresentation is one of the top reasons leading to mortgage loan repurchase requests. A VOE can be used to defend a repurchase request by validating the level of due diligence performed during the loan origination process. Doing so allows a lender to determine the borrower’s employment history when the loan was closed. Lenders typically do not rely on what consumers tell them about their employment. Lenders will verify this information using various sources, such as pay-stubs and phone calls to employers. Verification services providers also perform a standard VOE as an outsourced option. Many verification services providers are innovating in this space, building emerging products like bank transaction data and data models. These emerging products are steadily gaining traction and acceptance in the marketplace and are products to keep an eye on. Validate the employer’s phone number. A borrower may perpetrate fraud by providing the lender a phone number to an accomplice who has been given the instructions to act as a fictitious employer. This accomplice, when contacted by the lender, provides fake employment data which misrepresents the borrower’s employment. This scam is why the employer’s phone number provided by the borrower must be validated against a third party source, such as a Google search, 411.com or other online source to verify the existence of the business. Retrieving a company report, such as a Dunn & Bradstreet report, checking with the Better Business Bureau or reviewing the businesses filing with the state office, such as a Secretary of State, are also options to validate the employer. Contact the employer. During the course of the phone call the following information should be gathered: Employer name, Employer address, employer contact name, employer contact title, current employment status, job title, most recent hire date, length of time employed and the date of the call. 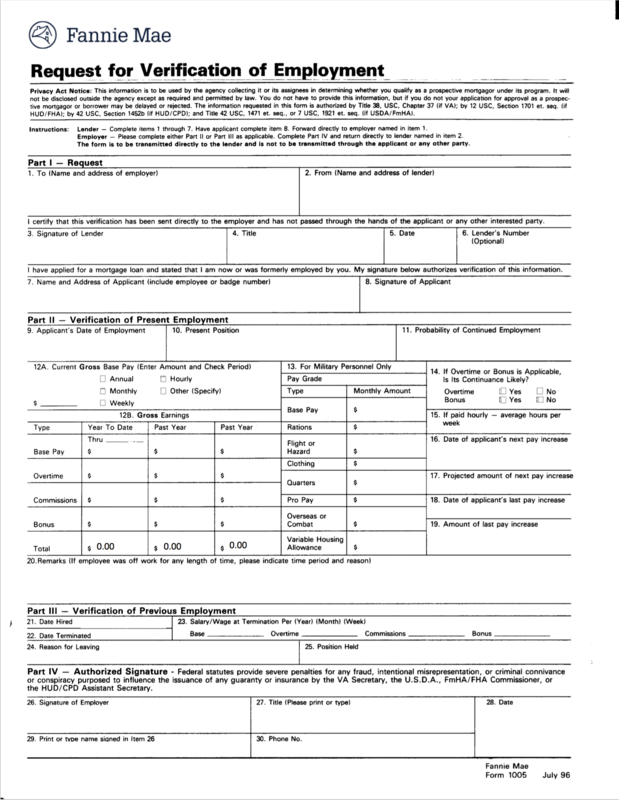 Document the verification of employment. A record of the information used to validate the employer, as well as the employer data obtained should be added to the loan file . HR departments may require proof that you have the borrower’s consent to release information. In our experience, HR will generally provide data related to a borrower’s employment, but will draw the line when asked about the borrower’s income. In any case, it is advisable to have available a signed 'borrower authorization to release information form', in case it is needed. When verifying a self-employed applicant, the borrower’s business filings with the applicable licensing bureau and/or regulatory listings are investigated, and in some cases, the tax preparer is contacted. The business can also be verified by using a telephone book, the internet or directory assistance. Verification services providers have created products that satisfy VOE. There are two “traditional” types of employment verification products, 1) verifications performed manually and 2) verifications that are fulfilled by data. Service providers who perform manual verifications typically have faster turn times and higher quality than the verifications completed by a lender’s in-house processor or underwriter. They are able to perform better because of their experience on repeatedly contacting employers, in addition to their custom technology used to fulfill orders. Manual verification service providers maintain a database containing information related to their experience in contacting employers. They add phone numbers that have already been validated by a third party, the contacts at the employer that are most responsive in providing the data needed to complete the VOE, and requisite information needed to allow for the employer to release a borrower’s employment information. This “experiential” data is updated each time a verification is completed and used the next time a verification is ordered for a borrower who works at that employer. This data contributes to a speedy fulfillment process. Manual verification service providers leverage purpose-built workflow platforms designed specifically for fulfilling manual verifications. These technologies include automation (typically auto-dialing phone calls) and system enforced audit checks. This technology blends in the experiential data from the database mentioned above to ensure call agents avoid unnecessary or repeat tasks. The workflow provides key performance indicator (KPI) tracking and visibility into the process and inventory of work to be completed. Built-in audit checks ensure required employment information is gathered before the report is finalized, often highlighting to the agent what is missing while they are on the phone with the employer contact. This technology results in a consistent, low-cost and audited report. Verification services providers can complete VOEs leveraging databases consisting of employment data that is collected directly from the employer. One such service, The Work Number® from Equifax, is widely known throughout the mortgage lending ecosystem (and others). Equifax manages the nation's largest centralized repository of income and employment verifications, powered by The Work Number, a proprietary data asset containing more than 350 million payroll records. Employers contribute data to The Work Number® database each time payroll is run. Equifax, in turn, provides this information to credentialed lenders within seconds of the VOE order. Database sourced verifications are highly efficient, often integrated directly into a lender’s Loan Origination System (LOS) and can be accessed 24x7. The Work Number® – VOEs submitted through Credit Plus go directly to The Work Number® so there’s no waiting for the VOEs you need. The Work Number®, a solution offered through Equifax Workforce Solutions, is the largest collection of payroll records contributed directly from employers. Its database houses employment records from thousands of employers nationwide. This information is updated every payroll cycle, so you’ll always receive the most up-to-date information possible. Equifax Workforce Solutions is a business unit of Equifax Inc., Atlanta, GA. Credit Plus is an authorized reseller of products and services provided through Equifax. The Work Number® is a registered trademark of TALX Corporation, a wholly owned subsidiary of Equifax Inc.
Manual Verifications – If your applicant isn’t in The Work Number® database, you’ll be given the opportunity to immediately order a manual verification. Credit Plus follows a uniform, auditable process for manual verifications, and delivers the validation you need in just 1-3 business days. Do you require that I submit proof of borrower consent on every order before you will process the order? What third party sources do you use to validate the employer’s phone number? What is your average turn time? What is your average order completion rate for manual verification of employment? Does the borrower’s employment data come directly from the employer? What job data is included in the verification? What is the hit rate of your automated database verifications? Verifying employment is an important and required step in mortgage lending. It is a task well-suited to be outsourced to experts with the experience, data and tools. Coupling a data-based employment verification solution with one that is manual may be a smart way to set up your VOE process. This ensures that VOEs that can be fulfilled using data are done straightaway and all others default to a manual process. Outsourcing VOE may free up your processing and underwriting resources to focus on other more value added work.